We believe in giving back to society. Besides sponsoring some book prizes and bursaries of various local polytechnics, the company also matches dollar for dollar, all staff contribution to the SHARE (Social Help and Assistance Raised by Employees) programme that was started since 1993. 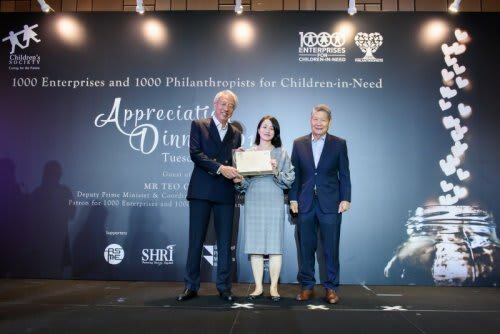 A heart-warming event at the 1000 Enterprises and 1000 Philanthropists for Children-in-Need Appreciation Dinner held on 19 March 2019 organised by the Singapore Children's Society. This is the second year RSM participated and supported the Singapore Children's Society's 1000E fund-raising programme which aims to provide help for children in need. Woo E-Sah, Partner & Industry Lead for NPO Practice, represented RSM to receive the Award from Deputy Prime Minister Teo Chee Hean, who graced the event as Guest of Honour. Our volunteers cooked up a storm at the Willing Hearts soup kitchen on 24 November 2018 where they prepared and distributed meals to the needy in Singapore. 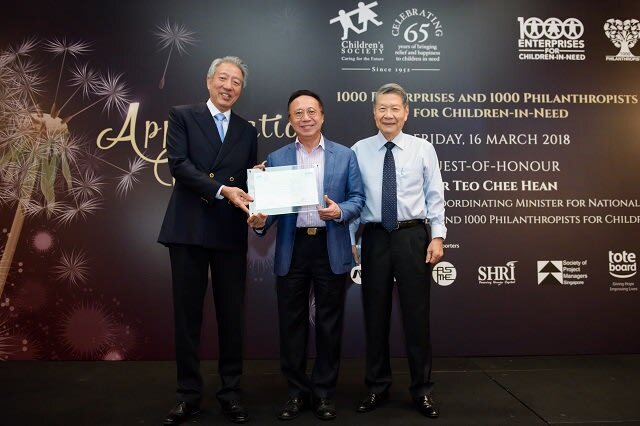 RSM was presented a 1000 Enterprises for Children-in-Need (1000E) Award in recognition of our participation as a Leading Enterprise supporting Singapore Children's Society's 1000E fund-raising programme, which aims to transform the lives of children in need. Sovann Giang, Senior Director, Risk Advisory & Deputy Industry Lead, NPO Practice, represented the firm at an appreciation dinner on 16 March 2018 to receive the Award from Deputy Prime Minister Teo Chee Hean, who graced the event as Guest of Honour. Elderly residents from SASCO Senior Citizens’ Home were treated to an afternoon of fun art and tech, in celebration of the mid-autumn festival. Forty volunteers from RSM initiated the more adventurous elderly to online games and helped the rest paint personalised creative lanterns. 14 team members helped with stock taking, asset tagging, packing and moving of items. Team members and residents engaged in light exercises, fun activities and a Lo Hei lunch. Donation helps the Singapore Children’s Society protect as well as nurture children and youths in need. Volunteers and over 50 kids from CCH visited KidsSTOP to participate in educational activities. Runners from RSM joined over 600 other participants to raise $120,000 for Peace Connect and Bright Hill Evergreen Home. The event celebrated the group’s 30th Anniversary and served as a platform to give back to society by raising donations for the underprivileged to help improve their lives. Over 1,000 participants took part in the event. Guides brought over 25 volunteers and the children from CCH on a tour of the farm and shared tips during a hands-on gardening class. Team members served lunch to over 80 residents and organised an afternoon of games and activities. 35 volunteers from the firm accompanied over 50 children from CCH to Amazonia’s indoor playground for an afternoon of fun and educational challenges. SBA Stone Forest donates computers to Huang Ba primary school for the setting up of learning lab. In May 2013, SBA Stone Forest donated 30 PCs to Huang Ba primary school in Dejiang Village, China. Students were able to familiarise themselves with the use of computers from a young age and promote learning through engaging and interactive tools. Participation in Frost the Trail 2012, a corporate charity run organised by Frost and Sullivan. 40 runners from audit took on the 5km team challenge. A total of $5,000 was raised for the Bright Hill Evergreen Home - a non-profit nursing home. Over $5,000 was raised for the Singapore Cheshire Home and the Lion Befriender's Club to purchase necessities for the elderly. Firm teams up with Food from the Heart once again to distribute food to needy families and the elderly. $13,300 was raised and went into buying essential food items, including cooking oil and rice, for the recipients. 50 staff members volunteered to help with the distribution of the food goodie bags at 11 locations across the island. One of the key sponsors for myMosaic, and to support our client - Chye Lee & Sons Pte Ltd - and its adopted charity, the SACS Family Care Centre. Raised $103,838 for The Straits Times School Pocket Money Fund. Guests were invited to donate money in lieu of sending flowers for its new office opening and the sum was matched dollar for dollar. Key sponsor for Project Summer on Sand (SOS), a community service project organized by SMU Tritouch Connexion from May to July 2008 for the EN Community Services Society and Chen Su Lan Methodist Children's Home. Contributed close to $90,000 to 15 charities, they include Children's Cancer Foundation, Singapore Cancer Society, The Spastic Children's Association of Singapore and Chung Hwa Free Clinic. Contributed over S$100,000 to various charities. More than 10 charities benefited from firm’s donation of close to S$120,000. These charities include Chung Hwa Free Clinic, Man Fut Tong Nursing Home, Ren Ci Hospital and the SGX Bull Run. Donated close to S$120,000 to several charities including the Singapore Red Cross Society, the SGX Bull Run and the Rotary Club of Queenstown which received S$10,000 each. Produced and sponsored a 2005 desk calendar with the theme of "A Tribute to Growing Businesses" to commemorate the 20th Anniversary of the firm's founding. Together with a handful of clients, S$168, 000 was raised for the benefit of 16 charities. Management and staff of the firm also raised close to S$22,500 for the Singapore Red Cross Society Humanitarian Assistance to the victims of Tidal Waves Asia. Donated S$70,000 to several charities. Donated S$100,000 to 10 charities. Produced and sponsored the sale of calendars in aid of Chung Hwa Free Clinic. A total of S$35,000 was raised. A charity drive in aid of the Home Nursing Foundation was organised, where S$77,700 was raised.